There are more than 4000 engineering colleges in India. Over the past many years, engineering colleges ranking has been done diligently by a number of survey and education experts. It has been observed that these rankings have been done on certain unique criteria, though largely each ranking is based on one or two specific factors. While some have considered placements and infrastructure, others focus on year of establishment and research. Points such as research, quality of professors and academic achievements have also been considered. The Top Engineering Colleges in India 2017 ranking presented here includes the ranking of National Institutional Ranking Framework, Ministry of Human Resource Development, Government of India. 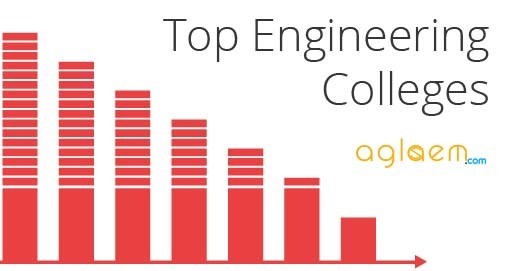 They have released the rankings taking cumulative factors that define an engineering college. Trends and growth of these colleges have been studied to create the list and ranking, broadly considering the following. Research, Professional Practice & Collaborative Performance. The National Institutional Ranking Framework (NIRF) has been approved by the MHRD and launched by Honourable Minister of Human Resource Development. Although the Ranking Frameworks are similar, the exact methodologies are domain specific. Ranking methods have been worked out for 6 categories of institutions i.e., Engineering, Management, Pharmacy, Architecture, Universities and Colleges. What is the need for Top Engineering Colleges in India 2017 Ranking? While we always maintain that a student who wills to excel can do so in any given circumstances and any college, rankings remain important. At the crucial stage of selection of colleges, when a student needs to decide which college to go to, an informed decision is what would take the career forward. The names given in the list take admission on the basis of various entrance exams such as the Joint Entrance Exam (JEE), BITSAT, VITEEE, EAMCET, WBJEE and others. A student who has appeared and qualified in these exams has to ultimately decide where to go ahead. We simply aim to make this a little easier by throwing some light upon the names that can give him better opportunities. Why is the Top Engineering Colleges in India 2017 Ranking different from or same as other rankings? No ranking can be final and complete, as the process of such judgement is ever changing. With each change in process of admission, fee structure, course or curriculum; a number of factors get affected. A college that is more reputed in the field of say mechanical engineering, can get wonderful placements one year. But the next year, due to change in industry demands, placements might not be as great. Similarly, there could be change in eligibility clauses of admission that may affect the quality of students and consequently the academic achievements of the college. As an engineering aspirant, should I select colleges on basis of Top Engineering Colleges in India 2017 Ranking? Yes, and No! The debate of College vs Branch is an ever raging one. The first thing you should think is “Which are the three branches of engineering I would like to do?”. Keep your list open to at least three – five branches. Now check out the ranking and see out of these, of which colleges have you appeared in the entrance exam / or will be appearing in. Now try to narrow down to twenty colleges where you would like to study the next four years of your engineering. Once you have secured a rank in one or more Engineering Entrance Exams, against your rank, the desired colleges list and this ranking; select your college. As a student / parent / academician, you might feel that a certain name or names have been missed out, and perhaps you see a name you have not heard of before. We are open to queries and suggestions. Please feel free to share your thoughts about Top Engineering Colleges in India 2017 in the comments below. This article gives us useful information about engineering colleges. I read it, but i found some ITI related information. And it’s tell us eligibility criteria and other details about admission.